Mobilise your workers to become autonomous problem-solvers and critical thinkers. Integrated technologies for designing, facilitating and assessing action learning in the workplace. A unique framework for skills development that delivers measurable results in real time. Collaborate across your region, supply chain or industry and get fresh eyes on 'wicked' problems. Contact us to learn more about how to establish or join action learning programs in your region. 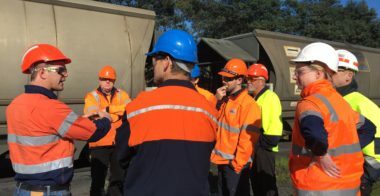 Latest news: We are pleased to announce that our world-first Lean Action Learning program has been recognised as a finalist in Industry Collaboration at the South Australian Training Awards. Action learning is a low-risk way for businesses to practice collaboration, allow their employees to develop the skills required for future work, and realise the talent already available in their organisations. The Action Learning Institute (ALI) is the first education institution in the world to deliver nationally recognised qualifications entirely through action learning.